Atmospheric and distinctive late-night bar offering a great lineup of gigs and club nights, bargain drinks and eclectic food offerings. Back in August 2016 music bar Nice'n'Sleazy invited the Squid & Whale, who previously had a bar-diner on Great Western Road, into their kitchen for a pop-up and it proved so popular they decided to move in indefinitely. Tacos take centre stage, with a variety of creative meat options (slow-cooked pork with red onion and mango) as well as vegetarian and vegan choices. The chipotle-dusted, pan-fried red snapper taco is smoky with a fresh Mexican slaw adding a satisfying crunch. High-quality ingredients and careful cooking shine through, there's no sad beef mince here – the carne asada burrito is packed with tender marinated steak strips. Nachos layered with spicy cheese and salsa fresca are ideal as accompaniments or for sharing over beers. Nice'n'Sleazy continues to do what it does best: a great lineup of gigs and club nights, bargain white/black Russians and a grungy décor of graffiti scrawled walls. With the addition of the Squid & Whale it can add delicious, Mexican-inspired food to its brag list. A queer cabaret show including live music, drag, poetry, comedy and performance art. 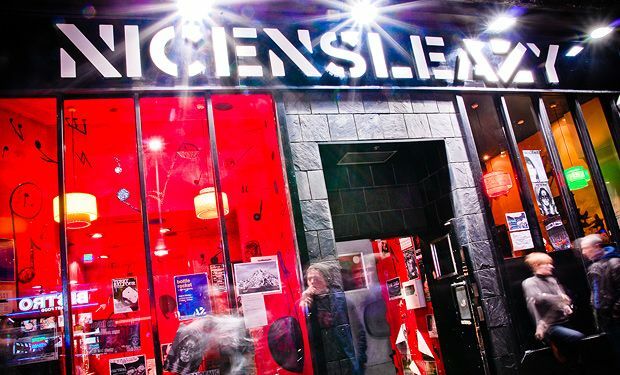 A long-standing Glasgow institution, Sleazy’s can boast great food, great bands and the best jukebox this side of New York reckons David Pollock.